Life in First Grade: Increasing your students' thinking! Happy Sunday, friends! I wanted to share with y'all my newest creation that is quickly becoming one of my favorites. 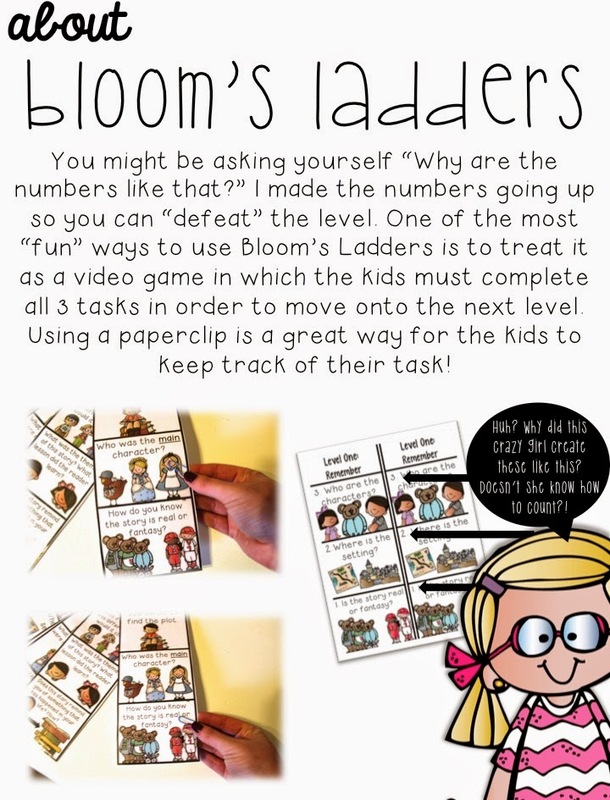 I made Bloom's Ladders for upper grades, but after a ton of emails, I created a lower version for my k-2 friends! If you don't follow Life in Fifth Grade, you're probably thinking, " Umm, what are Bloom's Ladders?" 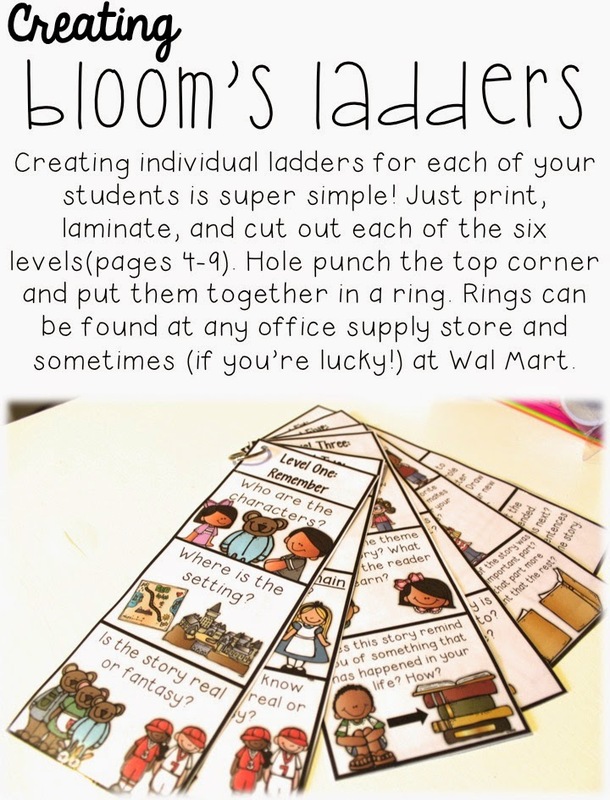 Blooms Ladders are my way of increasing my students' thinking. Using Bloom's Taxonomy, I've created ladders which feature multiple tasks that students must complete in order to move onto the next level. Since I teach fifth grade now, I have to work reeaallly hard to motivate my kids to simply care and want to do a good job. So I decided to treat these ladders as video games or apps. Students must complete each task on each level in order to "defeat" the level and move onto the next one. I just have my kids use their own paper to answer each task, but I've designed different options of answer sheets for this lower version. Another version of this "game" is How High Can You Go? 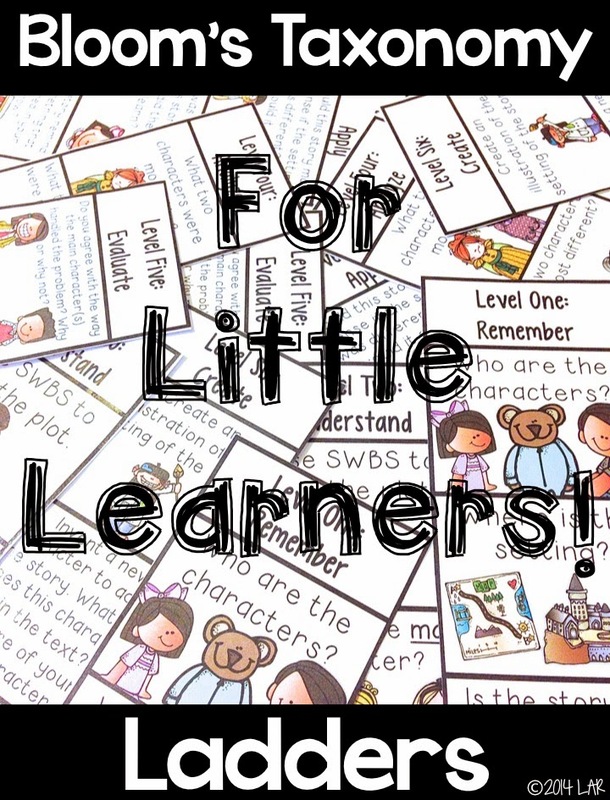 This activity features one task for each level. Four sets are included focusing on different skills like character, plot, setting, and problem/solution. Keeping track of which task you are on is super easy by using a paperclip! This provides a visual for the kids and lets them really see when they have defeated each level. I've also included a copy of my Bloom's Taxonomy posters in the unit. I always like to display these posters so my kids can be in charge of their own thinking and really understand their level of thinking. We've done these so much, my kids will sometimes say, " Hey! That's a level 6 question, Ms. Leslie Ann!" We love HOTS problems! Click here to grab your copy or wishlist it for tomorrow's Cyber Monday SALE! Or you can try and win a copy over on the Facebook Page! Love the idea of this. Parents could use this when reading to their "llittles". How do you use these in the classroom as far as checking them? I have many students who would not actually get the answer right and just move on to the next level, which defeats the purpose!